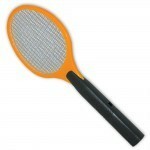 PRODUCT DESCRIPTION: Small tennis racket looking device which is used to electrocute insects. It is powered by two "AA" batteries, which are not included, and works very well at delivering a zap of electricity which is more then strong enough to instantly fry most any insect. The unit does not have an "on" switch but rather a button which is depressed when you are targeting an insect. When the button is pushed on you will see a little red light turn on letting you know you can "zap". All it takes is a touch on your target and it will instantly die within a few seconds. The device is not intended to "swat" at insects. Instead, it is used to "fry" them and all it takes is a gentle touch. In fact, swatting at them may actually cause you to hit the insect away or damage the device so don't use it this way. Simply place it in front of flying insects or on top of crawling insects and you will get the desired results. IT IS IMPORTANT TO KNOW THAT THIS IS NOT A TOY AND SHOULD BE KEPT AWAY FROM CHILDREN. IT WILL NOT HARM ANYONE TOUCHING THE ELECTRIC GRID BUT IT DOES HURT QUITE A BIT AND IS PAINFUL TO TOUCH. WHERE TO USE IT: Inside or outside and out of the rain. Since this is an electric device, it is important to keep it dry.